Yes, Speedify does have an Internet Kill Switch functionality for Windows. It can prevent your sensitive data from going out unencrypted if Speedify cannot connect to the speed servers. The Kill Switch setting is disabled by default. When Speedify is disconnected and the Kill Switch is enabled, your computer will have no Internet access. Go to the Setting gear icon on the main Speedify dashboard. Under the Privacy section, you will see the "Internet Kill Switch" option. To enable it, just toggle the slider on. Follow the same steps as above - just make sure the slider is off. 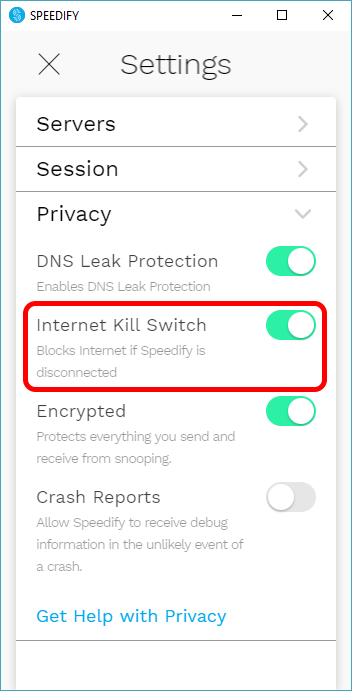 If you get a "No Internet access" error (you can't access the Internet) and Speedify is disconnected, check the Kill Switch status. Learn more about the Speedify Kill Switch on iOS.